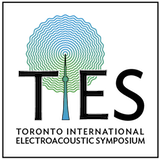 Note: Unless otherwise indicated, symposium events take place in room 330 of the Edward Johnson Building, Faculty of Music, University of Toronto. 80 Queen’s Park Cr. Toronto, Ontario. M5S 2C5. Michelle Arbuckle & Jason van Eyk — CMC and the Electroacoustic Community: Past, Present and Future. Location: Chalmers House, 20 St. Joseph St.
Mark Nerenberg — Aleatoric Techniques: Piece for Saxophone Quartet and Live Electronics 1st mvt.